381 in stock Need More ? 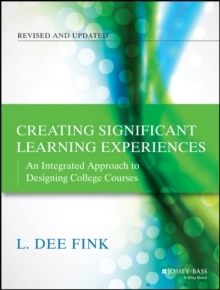 In this thoroughly updated edition of L. Dee Fink s bestselling classic, he discusses new research on how people learn, active learning, and the effectiveness of his popular model; adds more examples from online teaching; and further focuses on the impact of student engagement on student learning. The book explores the changes in higher education nationally and internationally since the publication of the previous edition, includes additional procedures for integrating one s course, and adds strategies for dealing with student resistance to innovative teaching. This edition continues to provide conceptual and procedural tools that are invaluable for all teachers when designing instruction. It shows how to use a taxonomy of significant learning and systematically combine the best research-based practices for learning-centered teaching with a teaching strategy in a way that results in powerful learning experiences for students. Acquiring a deeper understanding of the design process will empower teachers to creatively design courses that will result in significant learning for students.